This episode is sponsored by my Longaberger Home Business, Quince & Co and Knit 4 Together. Knit 4 Together is a knitting and fiber shop in Dunlap IL just north of Peoria IL. We are a cozy, friendly yarn shop with wall to wall fiber, especially natural fiber and specialty yarn. Knit 4 Together has unique yarn bowls made by our own pottery artist. All the notions you will need for your project are here too. You can find us at www.knit4together.com or call 309.243.9499 Come join us for a cozy place to knit. Knit 4 Together is as much about our yarn as it is about community! Thanks to everyone who was in touch with me in the past week. I heard from new Pipeliners SarahAA, MissMeredith1, catface85, windpins, pinstripe, casuey, sandinmysocks, GayleBN, krisluvswool, rambunctiousky, bridgetmaxine, and Theresa Schaber. Note from Strid8 who is Astrid. I asked her permission to share this story. Hi Paula, I was reminded of a funny story when you talked about the recumbent bike in one of your recent episodes. I was helping out at a friend’s yarn store when two regular-ish customers were talking about a friend of theirs who had recently retired. She had gotten a recumbent bike, and was in heaven. Every day, in the late afternoon, she would get on her bike, audiobook on her iPod, glass of wine on the side table, and knitting in hand. Sounds like heaven to me! They went on to relate that this woman was totally knitting obsessed, saying, with amazement, that “she even knits in restaurants, at the table, while she’s waiting for her food.” When I didn’t make any comment, one of the ladies said to her companion “she (meaning me) doesn’t think there’s anything odd about that”, and turning I me she said “I bet you do that too.” “All the time!” I responded. They still tease me when they come in the store. My (long-winded) point is this: the recumbent bike offers great knitting time. Maybe not for the most delicate or complicated work, but for standard, mindless knitting, it’s great! Well, I’ve prattled on enough. That woman is my new heroine and role model! Beatrix Potter: A Life in Nature by Linda Lear. · Mini-skein Swap Thread—a lot of interest Friday night. More info later but it will be very relaxed and I’m sure there will be plenty of Magic Cakes in the making there. We should reach 1 Million downloads when this episode is released! Thank you! Team Pipeliners! 50+ and growing! I want to share with you the view from my window today. It is so beautiful out there and I tried to capture a bit of it for my Instagram followers but it never quite makes the mark. The snow is falling steadily but gently and has been for the past 3 and a half hours. There are so many cardinals and other birds vying for their spots on the feeder. I’ve estimated there are at least 30 cardinals within sight right now. An occasional blue jay flashes blue and black as he finds a spot on the platform feeder. A Red bellied Woodpecker looks for food on the locust tree. Below the feeder there are at least 20 smaller birds feeding including the dark eyed juncos we talked about lst week, goldfinches (also on the niger seed feeder), tree sparrows, and fox sparrows. A fox sparrow, the largest of the sparrows came right up to the window a few minutes ago. These sparrows have a funny way of scratching in the snow. They have a heavily striped breast with a spot in the center, a rusty cap, and rusty tail. One fox squirrel and two gray squirrels are also eating at the base of the feeder. We broke a record cold this week along with a lot of other locales. It was -13 in Peoria. Yesterday, (Thursday) we reached 34 F which is the first day in February that the temperature was above freezing. It is still good eagle watching weather. I took a group of ladies down to the East Peoria Steak & Shake. At first we didn’t see any bald eagles but suddenly one flew right towards the window where we were sitting and landed in the tree right above us. The ladies were so excited I thought we might scare him away but he was nonplussed. He kept his back to us so I didn’t get the greatest photos. In backyard bird news there are more birds singing their mating and territorial calls. The cardinals have joined the chickadees and tufted titmouse. Last week when I talked about the Dark-eyed Junco I forgot to say the scientific name which is Junco hyemalis. I’m thinking of trying to memorize the scientific names again. Maybe we will take one bird per week and see how that goes. For now let’s remember Junco Hyemalis. 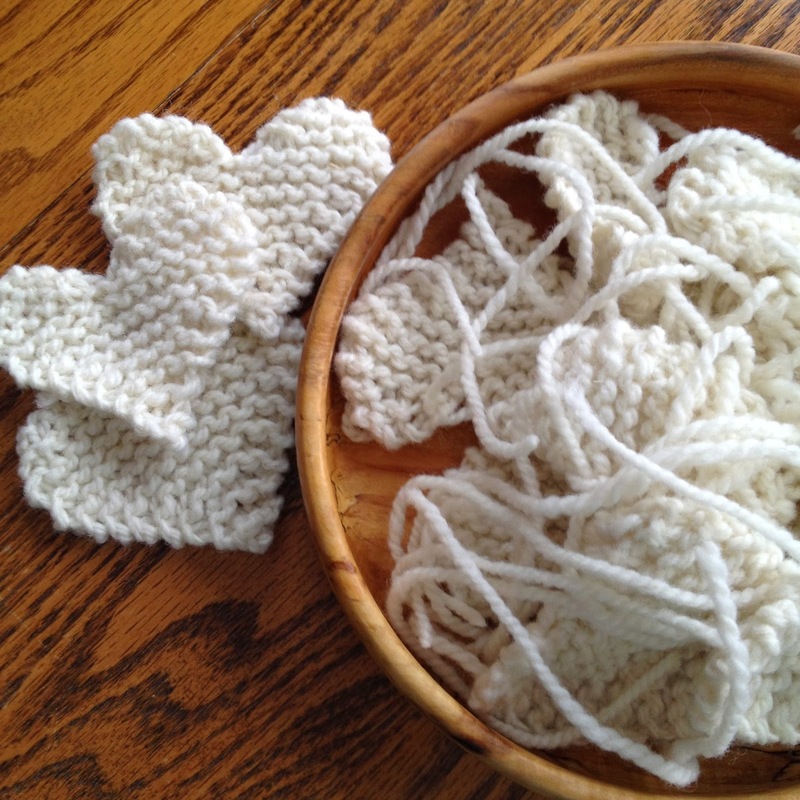 I knit another garland of hearts. Photo tutorial showing how I attached hearts to string. · digital format by Interweave Knits for $15.95. · Domino knitting is modular knitting but all modular knitting is not domino knitting. · Modular Knitting can be any shape that is replicated and put together to shape a garment. Hexipuffs for The Beekeepers Quilt is an example of modular knitting. There is a red ball of yarn in upper right corner that shows where I started for Ravellenics. I work from right to left across a row although it does not have to be done that way. Update on my blanket: Around 210 squares/diamonds. “the snow-banks melt, and the face of the earth becomes green before it, so shall the advancing spirit create its ornaments along its path, and carry with it the beauty it visits, and the song which enchants it; it shall draw beautiful faces, warm hearts, wise discourse, and heroic acts, around its way, until evil is no more seen. So excited to hear my yarn is in your blanket! I just love how you keep going on field trips to Steak & Shake!! Your story of the waitress saying there were no eagles reminded me of our last snowy owl hunt. Just don't give up, and an eagle might just fly up to the window to you! I laughed out loud when I heard Astrid's story! In restaurants is only one of the strange places we bring our knitting!! The restaurants is really one of the more normal places we take our knitting!! Your comment about "jumping reality" made me laugh too! !